I wasn’t wild about whipped cream until I tried real whipped cream. Have you had it? I sure hope so. It puts Cool Whip and the canned stuff to shame. 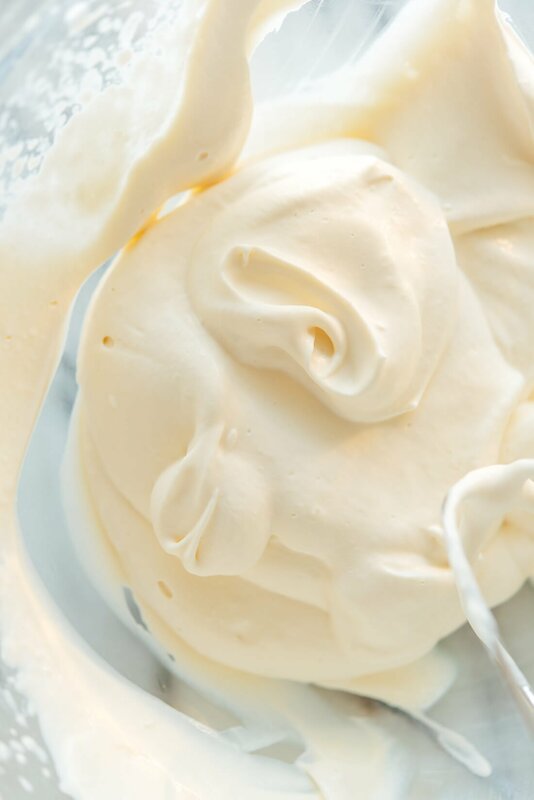 Homemade whipped cream is ultra luxurious, decadent, and as delicious as the best vanilla ice cream. Real whipped cream doesn’t have any strange preservatives or additives, either. 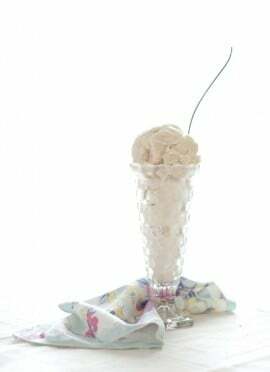 Whipped cream is the perfect creamy topper for desserts and hot drinks. Since the holidays are here, I thought I’d share a tutorial with everything you need to know about making whipped cream. If you’ve never made whipped cream before, it may seem a little intimidating at first, but I promise it’s so easy. You can make whipped cream in under 10 minutes! Whipped cream doubles in size. Meaning, if you use 1 cup heavy cream, you’ll end up with about 2 cups whipped cream. 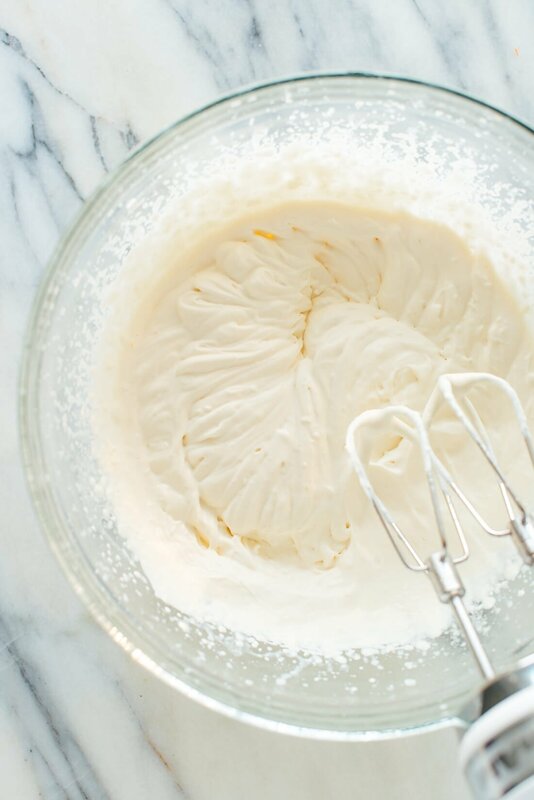 You can divide or multiply the amount of heavy cream to get your desired quantity of whipped cream (making extra is never a bad idea). Equipment options: I love using my hand mixer (affiliate link) to make whipped cream because I hate lugging out my heavy stand mixer. You can also use an immersion blender or whip it together by hand, if you’re patient (Bon Appetit has a video for that). Start chilled. At minimum, your heavy cream needs to be chilled. The whipped cream will whip up faster if your bowl and beaters are chilled as well. Use a tempered glass bowl (think Pyrex) or stainless steel bowl so it retains the cold temperature (plastic bowls will not). If you’re in a hurry, use a hand mixer or immersion blender. 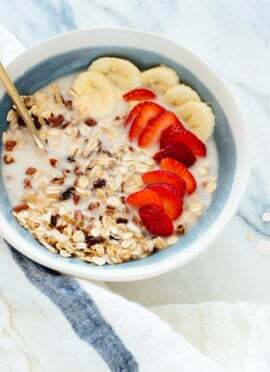 Choose a sturdy bowl with a smaller base and tall sides (a 4-cup liquid measuring cup is perfect) and chill it for 15 minutes in the freezer. That way, the blender is agitating more of the cream at once, and the cold walls help it whip up even faster. The only ingredient you really need is heavy whipping cream. To make it taste like the whipped cream you know and love, I recommend adding a tiny bit of sweetener and vanilla. Traditional recipe typically call for powdered sugar, but I like to use maple syrup or honey because they add a subtle hint of extra-delicious flavor. I like to use high-quality organic cream because I’m convinced it produces a more tasty end result. Pay attention. When you first start blending the mixture, it might not seem like you’re doing much. Then the whipped cream will start progressing from soft peaks to medium to stiff peaks fairly quickly. You’ll learn more about the differences between those textures below. Pies and tarts: Such as my pecan pie and apple tart. Fruity crisps: So many options! Apple crisp, peach crisp, blueberry crisp, strawberry rhubarb crisp and plum crisp. Cakes without frosting: Such as almond cake and olive oil cake. 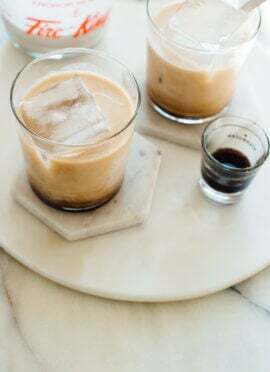 Coffee drinks: Think Irish coffee or your usual morning coffee. Soft peaks are like semi-melted ice cream. At this stage, the whipped cream is floppy but has an ultra luxurious texture. Soft peaks are perfect for folding into desserts or floating on top of Irish coffee. Imagine a slice of classic pumpkin pie dolloped with homemade whipped cream—that’s what medium peaks look like. At this stage, the whipped cream will have more significant swirl marks and a more stable structure. Also known as firm peaks, stiff peaks have an intensely rippled texture when you lift the beaters. Stiff peaks aren’t quite as luxurious and decadent as the former two, but you could ice a cake with this texture. Once your mixture reaches stiff peaks, stop blending! You’ll see what happens if you blend too long below. At this point, the mixture is grainy and losing volume. It’s literally falling apart—the fats and liquids are separating into butter and buttermilk, respectively. 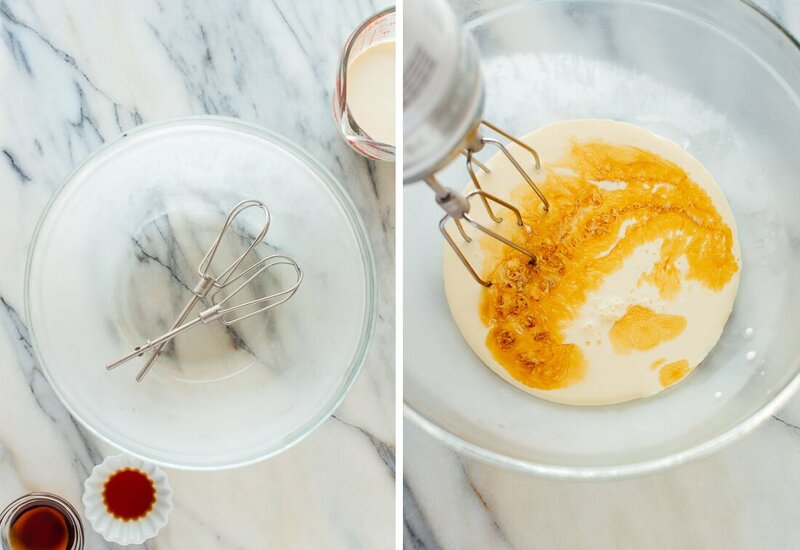 How to fix it: Depending on how over-whipped the mixture is, you might be able to save it by letting the mixture chill out in the refrigerator for 30 minutes to 1 hour and then stirring with a spatula to combine. For a more immediate fix, you can try stirring in a few tablespoons more heavy cream with a spatula. If those don’t work, you might as well turn the mixture into butter! Here, you can see examples of soft, medium and stiff peaks side by side. I hope it’s helpful! Please let me know how your whipped cream turns out in the comments. I’d love to hear how you use it. 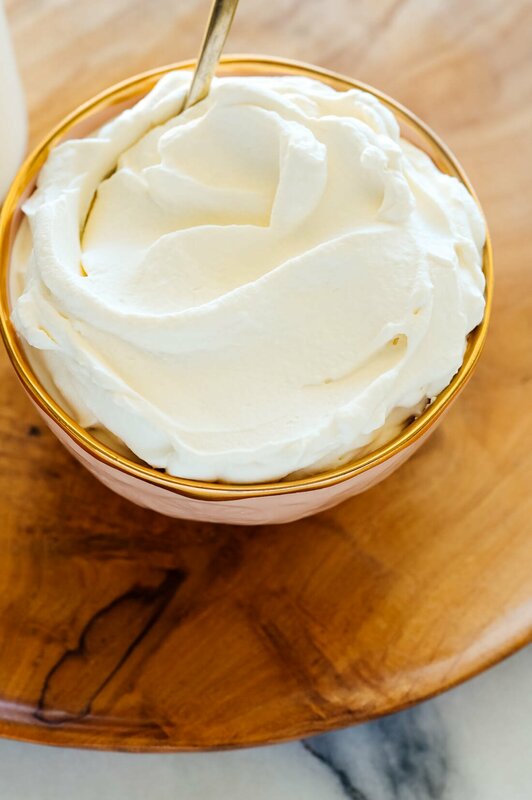 Learn how to make luscious homemade whipped cream with this simple recipe. 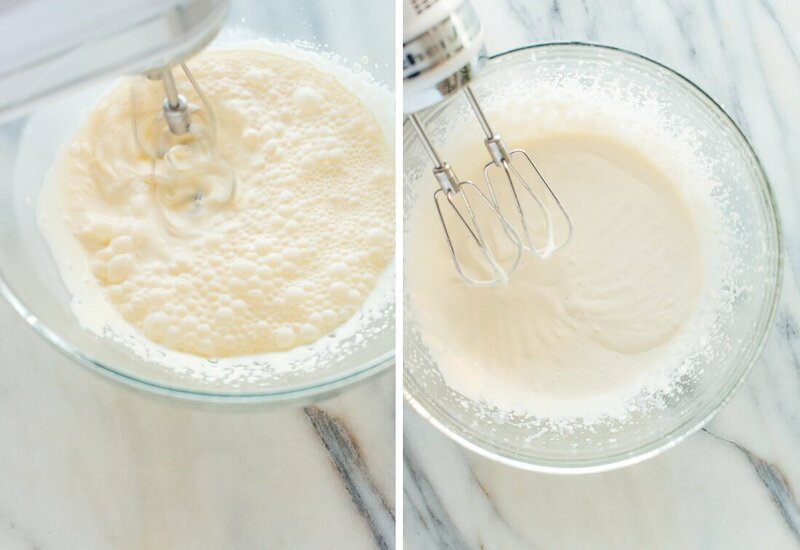 Your whipped cream will turn out perfectly, every time. Don’t forget to chill your bowl and beaters in advance! Recipe yields about 2 cups whipped cream. For quicker results, place your mixing bowl (either sturdy glass like Pyrex or stainless steel) and beaters (if using a hand mixer or stand mixer) in the freezer to chill for at least 15 minutes, or overnight. 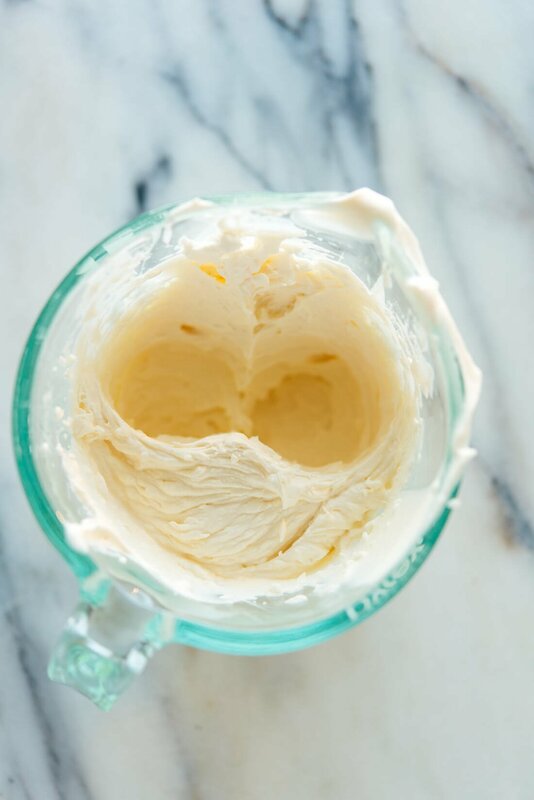 When you’re ready to make whipped cream, combine the chilled cream, sweetener and vanilla extract in your bowl. Start blending at low speed and increase to medium-high. Continue blending until the cream increases by nearly double—it might seem like you’re not doing much for a while, then the whipped cream will progress fairly quickly through stages. For soft peaks, continue blending until the mixture resembles melted ice cream and retains light swirl marks when you lift the mixer. For medium peaks, continue blending until the mixture retains more significant, closer-together swirl marks when you lift the mixer and mostly retains those swirl marks when you scoop it onto a spoon (this is the classic consistency that you would see dolloped on a pumpkin pie). 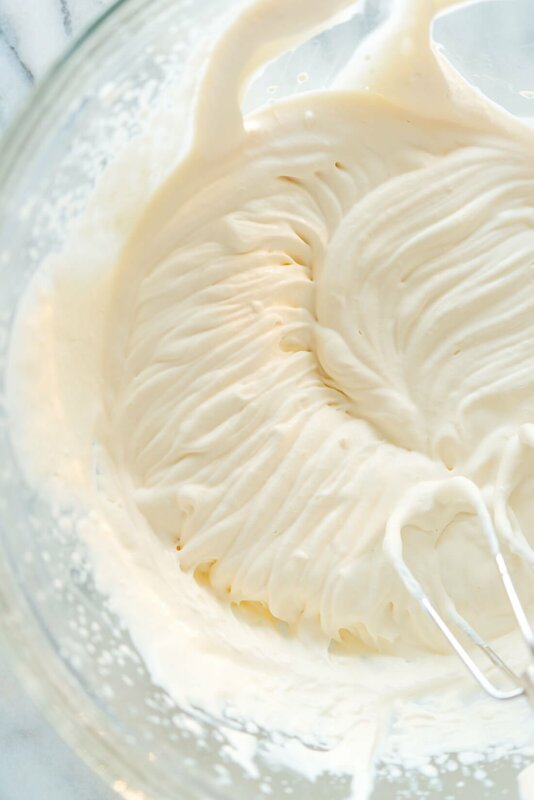 For stiff peaks, continue blending until the mixture has tight swirl marks and resembles Cool Whip (you could ice a cake with this texture). Don’t overdo it, or your cream will start turning into butter! Use whipped cream as desired. Whipped cream will keep well in the refrigerator, covered, for up to 5 days. If the mixture has separated a bit, gently stir it back together with a spoon. 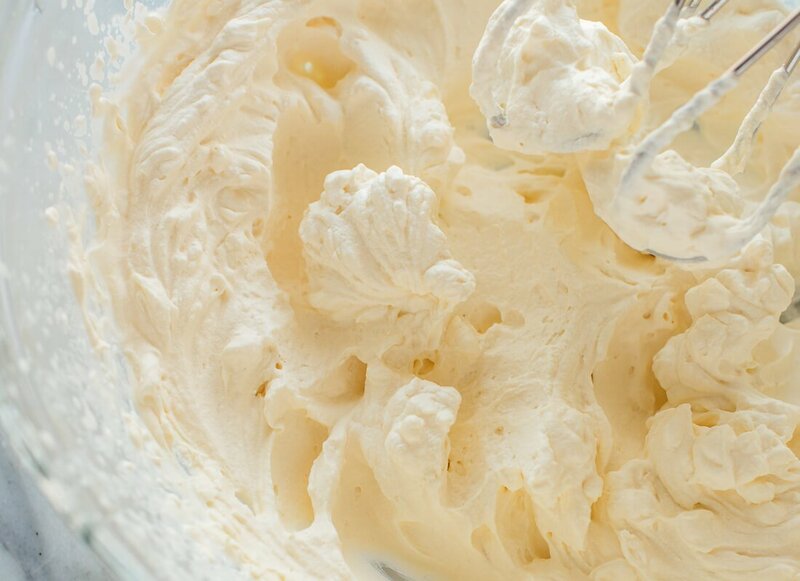 Homemade whipped cream loses some volume over time, so you may need to lightly whip it again to achieve the original texture. Change it up: For flavored whipped cream, you can add up to 1 tablespoon bourbon, ½ teaspoon ground cinnamon, or ¼ teaspoon mint or almond extract. Or, try 2 tablespoons cocoa powder or peanut butter. 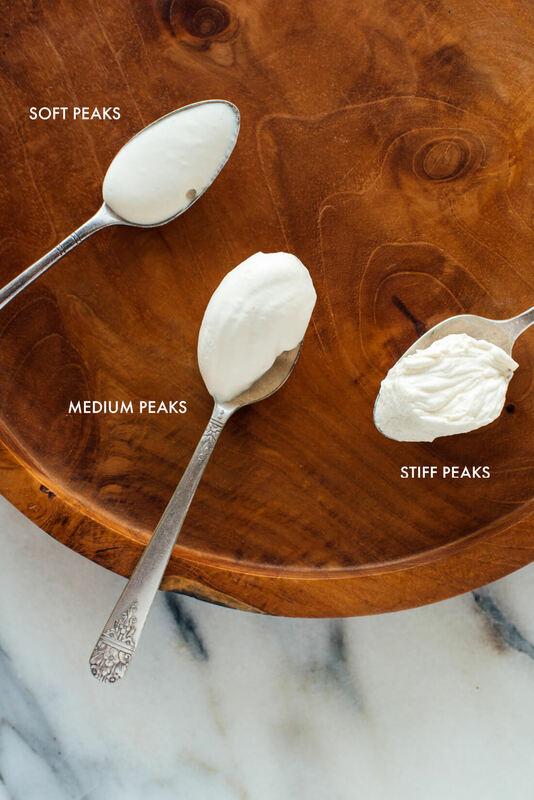 For whipped cream with a light tang, add up to 2 tablespoons thick yogurt or crème fraîche. Fresh whipped creme is the best! I have had really good success using my VitaMix, as well! I use maple syrup and vanilla powder. If you want really white creme then maple syrup isn’t a good option as it will turn it a darker color, but the flavor is awesome! Kate – the Irish coffee link isn’t working (Not found, error 404). Excited to make this for Christmas! I’m sorry about that, Karen! Technology is tricky sometimes. The link is fixed and you can find the Irish coffee post on my home page. Happy holidays! Thank you for all the visuals of the different peaks. I agree with you that the hand mixer is the way to go when making homemade whipped cream. My experience with my stand KitchenAid a couple months ago resulted in whipped cream on top but liquidy whipping cream at the bottom of the bowl the first time, and the second time it whipped it to almost butter in about 60 seconds! It was almost a disaster! Your method works very well, and I love the idea of adding some flavors in besides vanilla. I might add some orange or lemon zest sometime and see what happens! Thanks for the post! You’re welcome! I’m glad it was helpful, Rebecca. How do you stabilize the whipped cream so it doesn’t get all watery after a while? I put it in an airtight container in the refridgerator. If it gets a little runny, I put it back in my VitaMix for a few seconds and it looks fresh again, and no runniness or butter textures. you can add a couple tablespoons of mascarpone or cream cheese to add stability to the whipped cream. It will stand up longer and won’t become runny nearly as quickly. I had no idea this was so simple to make! Thanks for the breakdown. I’m going to try this with stevia. Love your blog btw. The design is gorgeous and so is your photography. It’s surprising that I had not considered that I could one day enjoy homemade whipped cream, but this changes everything. And incredibly, the recipe does not seem awfully hard to follow. I like that you explore some alternative options, makes the recipe more accommodating. Hi Kate – you’re the best! I am wishing you a happy birthday and a very Merry Christmas tomorrow! I am making my husband and I some Irish Coffee for Christmas morning :). I have made whipped cream a million times in my life but even then, I loved this post and found all the tips so helpful. I trust you so much and appreciate all of the work and testing and sharing you always put into your blogs. Thanks so much, Amy! I hope you had a wonderful time with loved ones. I’m a French pastry chef and as I make whipped cream almost all day long I really liked your article : homemade is definitely the best option you can get! And on a second note, if you want flavored whipped cream, a good option is to infuse it with your favorite tea/herb/spice : you just put everything in a bowl for the night in the fridge and the next day your cream will have all the flavors. Thank you again for your blog, and a very happy new year! I just tried this recipe and it turned out more bitter than I was expecting. Might I have put too much vanilla extract in? Or should I have used powdered sugar instead of honey? Or am I just too used to the overly-sweetened canned whipped cream? Thanks! Hmm! I would say you could adjust the sweetness level a touch or see the notes on how to change it up below the recipe. It shouldn’t have been bitter. Maybe your vanilla was on the bitter side? Yeah, I’ll try adding less vanilla next time. Thank you! What I love about homemade whipped cream is that it holds its shape much better than the stuff from the spray can. Very Good post!!! I love it! !